One of the symbols of the Tour de France went on public display in Leeds today as the city prepares to host the start of the world’s largest annual sporting event this summer. The official Grand Départ trophy is held each year by the area or city hosting the start of the legendary cycle race, and has now gone on display in Leeds Civic Hall as the city and Yorkshire gears up for the race start on Saturday 5 July. 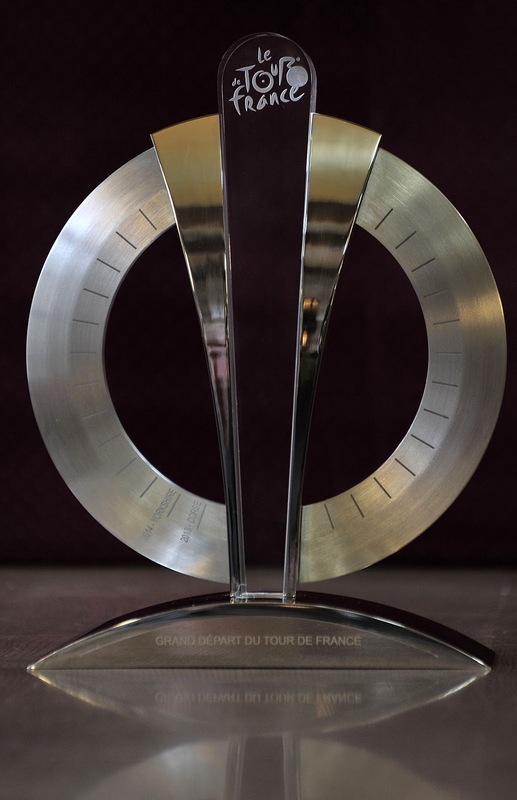 The trophy created by the Tour de France organisers Amaury Sport Organisation (ASO) was presented for the first time to the island of Corsica which hosted the Grand Départ of the centenary Tour last year. At the conclusion of the race, won by Britain’s Chris Froome, the trophy was officially passed over on the finish line on the Champs-Élysées by President of the Executive Council of Corsica Paul Giacobbi to Chief Executive of Welcome to Yorkshire Gary Verity who led the bid to bring the Tour de France to Yorkshire. With less than sixth months to go now before the start of the 2014 race, the ornate trophy featuring the Tour de France logo and inscribed with the names and years for Corsica and Yorkshire is now on display outside the council chamber in Civic Hall to further raise the anticipation level around this year’s event. As well as being on display in Leeds, the trophy will also be seen in locations along the routes of the two Tour stages in Yorkshire in the coming months before returning in time for the start of the Grand Départ in July. The start of the 2014 Tour de France will take place on The Headrow in the shadow of Leeds Town Hall on the morning of Saturday 5 July. The world’s leading riders will then follow a route out of the city centre through Moortown and Alwoodley before heading through the historic Harewood Estate and on to Otley, Ilkey and Skipton before a loop through the Yorkshire Dales on the way to the finish of stage one in Harrogate. Stage two takes the riders on a challenging hilly route from York to Sheffield, while the final day of the Tour in the UK starts in Cambridge and finishes in London. As well as start of the race itself, Leeds will also host the annual Team Presentation event at the new Leeds City Council-owned first direct arena on Thursday 3 July, while the countdown to the Grand Départ will feature a 100-day cultural festival celebrating the best of culture and the arts in the region. “The interest and media coverage in the last couple of weeks to mark the new year and six months to go is an indication of how excited everyone is getting around Leeds and Yorkshire hosting the start of the Tour de France. “This is a great chance for everyone to see the trophy up close and personal. 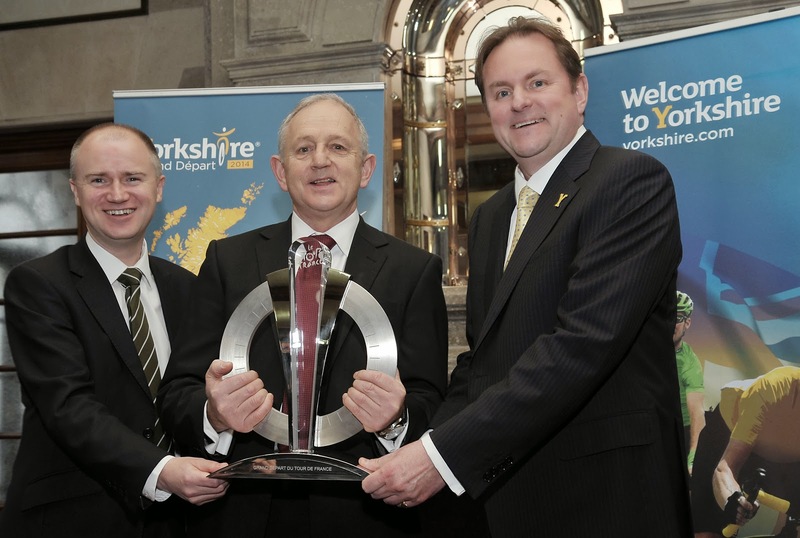 It’s wonderful to see Yorkshire inscribed on this impressive trophy and our county associated with the Tour. For the latest information on the Grand Départ including interactive route maps visit www.letouryorkshire.com.